Why stay at the Gite des Cerisiers ? * ski slopes, ski instructors, sledding slopes, cafes within 16 km drive at the Champ du Feu. 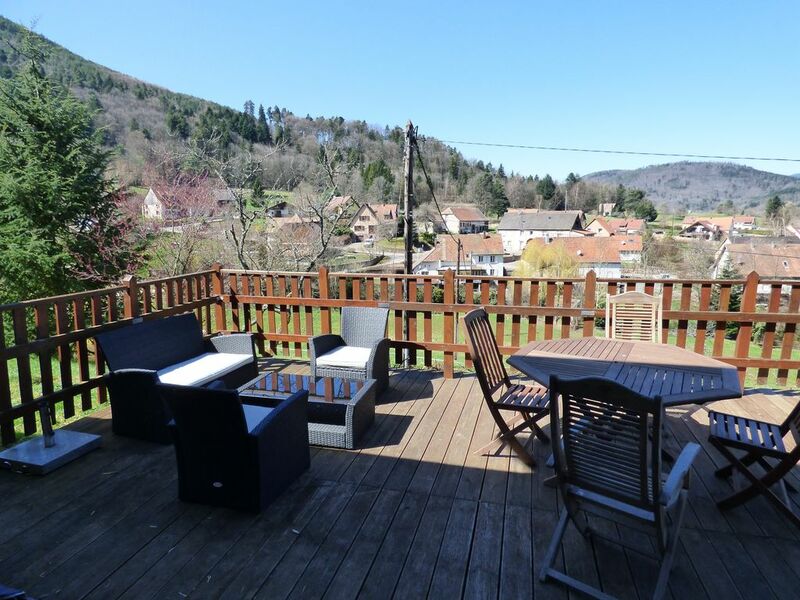 This charming country gite is located in a small village in the Val de Ville, at the base of the Vosges and its amazing mountain range. The area is peaceful and yet easily accessible to local amenities and close to many places of interest to visit. Le gite des Cerisiers is family friendly and well-behaved pets are welcome too. We do take pride in sharing our holiday home with our guests and have equipped the gite with good quality fixtures and fittings so that you can relax and fully enjoy your holiday. This property is full of character, featuring a log fire in the lounge, beams and a sandstone staircase and is spacious and comfortable. It benefits from stunning views on the deck, overlooking the village of Breitenau and the valley beyond. The downstairs area is open plan and includes a large lounge with comfortable leather sofas and satellite tv, a good sized fitted kitchen which includes a gas hob, an electric oven, a microwave, a steamer, a dishwasher, a coffee machine, a kettle, everything you need to cook a nice family meal and a large table to accommodate the whole family. Adjacent to the kitchen is a separate dining area with another large table and chairs. Another seating area / playroom is available with a tv with access to the Orange tv channels package including the Disney channel, construction toys, games and books suitable for children of different ages. Free internet access is available too. Also downstairs are a separate toilet and a shower room. Upstairs are 2 double bedrooms and 1 large family room (1 double bed, 1 single bed and 1 junior bed), all equipped with new beds and comfortable mattresses. Additionally there is a family bathroom with spa shower, washbasin, toilet and a washing machine. Our gite is ideally located to visit many touristic sights nearby and gives you the opportunity to retreat to a peaceful location after a busy day sightseeing. You can enjoy a meal at a selection of good local restaurants or opt for a take-away if you would like a break from cooking. Excellent pizzas at Franco's in Ville or at Fun Pizza. Chez Wendling Restaurant in Ville offers the option of eating out or having a take-away meal. The gite's location in the countryside means that you can take a walk from the doorstep, following one of the many signposted trails. They cater for families enjoying easy walks or ramblers looking for a more challenging itinerary. You may even be lucky enough to spot deers in the wild or some woodpeckers. The outdoors space available is great for families with children. You have an enclosed courtyard to the front of the house, which makes it safe for young children to play in. You have a play area to the side of the property, near the kitchen with a Swing ball set, a sandpit and this area is also ideal to play petanque, badminton or football. At the back of the property you have a large deck, perfect place to relax and enjoy the sunshine. You will love breakfast on the deck in the morning and a barbecue with a glass of wine later on in the day. If you decide to bring your bikes with you, we can provide you with a key to the garage to keep them dry and safe. We offer a home from home environment and for families we make child equipment available (e.g. : highchair, cotbed, bedding for cotbed, stair gates, baby bath, potty, toddler's cutlery and crockery). I have grown up in Alsace and now live in England. Alsace is a truly beautiful area, with a rich history and plenty of places of interest to discover. I still love to spend as much time as I can at the house with my husband and 3 children. We never tire of it as each season has something special to offer. In autumn, the wine tasting in local cellars is a must and so is schnapps tasting in distilleries. In December, you can experience some of the most wonderful Christmas markets around. Walking across the forest along the well signposted tracks is a sheer pleasure any time of year. As a family, we love the outdoors – walking, cycling, den building. After a busy day, we like to relax, play games & watch a good film. I am sure you will love it too ! We are committed to make your stay as pleasurable as possible and welcome any suggestions for future improvements. * Spacious, comfortable holiday home, * Great outdoors space with garden and large deck, bbq, garden furniture, secure courtyard, * Climbing frame and slide, * Ideally located to visit local sites and easy access to Germany and Switzerland, * Peaceful surroundings with beautiful mountain views all around the valley, * Great variety of activities available nearby for all the family including cross-country skiing, downhill skiing, horse-riding, swimming, * Free internet access, * Log burner for cosy nights in, * Children friendly (stair gates, highchair, books, DVDs, games, toys) * Pet friendly. The house is in a calm and peaceful area and yet it is so close to many amenities and restaurants. Local activities include : swimming, horse-riding, fishing, walking (from the doorstep), paragliding, cycling or mountain biking, playing tennis, Parc Aventure. We love the Christmas atmosphere throughout December with the amazing Christmas markets present in many towns in Alsace. This location is quite central. The property benefits from a large deck with garden furniture, including a barbecue. The deck is the perfect place for you to read a book, enjoy a glass of wine, relax in the sun loungers, play some games or spend some quality time with family and friends whilst making the most of the tranquility and beautiful views around you. You will love the fact that we are providing a home from home with new and comfortable beds, a well equipped and fully fitted kitchen, satellite tv, a dvd player, a range of books, Videos and DVDs, as well as games. One of the newest features is a real log fire in the lounge that adds to the warmth and comfort of the property. A lockable garage can be made available if you bring bikes with you. Family bathroom on the first floor with a shower, toilet, washbasin, cupboards and washing machine. Baby bath & potty. Shower room available on the ground floor with a shower and wash basin. Separate toilet downstairs too. Central heating available throughout the house with radiator thermostats so you can control the temperature in the rooms. Linen and towels are provided at a cost of £20 per double bed or £15 per single bed. Locked garage can be made available to you upon request in order to store your bicycles. Wood burner available in the lounge. Logs available for you if you wish to use this option. Please ask for help if you are unsure on how to use this. A big lounge with leather sofas and 2 coffee tables. There is a TV with satellite receiver and a DVD player. A playroom/second lounge with a toy box and a shelf containing a selection of books and games, TV, DVD player, Video Player and internet access. Filter coffee maker available at the property. New Dolce Gusto coffee machine with pods. Salt, pepper, spices, herbs, sugar, tea, coffee. The kitchen comprises a gas hob, a gas oven, a steam oven, a fridge freezer, a microwave and a dishwasher. A highchair is also available. The dining area is close to the kitchen - open plan. One tv in the main lounge with satellite tv. One tv in the playroom with a selected Orange package of extra channels including the Disney Channel. One tv in bedroom 1 with satellite tv. Orange tv package is available. The satellite tunes into channels from the Astra satellite. DVD player in the main lounge. Video player in the playroom. A selection of children books and adult fiction and non-fiction books is at the property. Toys suitable for different age ranges. They include a sand pit, lego, dolls house, pushchairs, cars and more. There is a bike shop in Ville, next to the Post Office (La Poste) where you can hire bikes from. Large deck area with garden furniture including a table, chairs, parasol, reclining chairs. Le Champ du Feu (approx 25 mins by car) is perfect for beginner skiers. It offers a range of small easy slopes and 10 surface lifts. Cross country skiing is also available at this location. Le Ballon d'Alsace (approx 45 mins by car) is a major national site and is the highest summit in the Southern Vosges mountains (1,247 m altitude). The panoramic view is breathtaking and Jeanne d'Arc (Joan of Arc) has even its statue on top. It is located at the cross-roads of three regions (Lorraine, Franche-Comte, Alsace) and four departments (Vosges, Haut-Rhin, Haute-Saone, Belfort Territory). "Ballon d'Alsace" provides 5 ski areas and is well suited for family outings, as it satisfies both downhill and cross-country skiers. Trails for snowshoeing, dogsledding and a luge area are also available. A ski school provides private and group classes for all these activities. Ski equipment can be hired from the sports shop in Ville (2kms away), next to the Post Office (La Poste). 6 golf courses are available in the area. 1. Ammerschwihr (closest - approx 30 mins drive). Located in Alsace, in the heart of the Wine Route, not far from Colmar and Strasbourg, enjoy the 18-hole course of the Golf d’Ammerschwihr Trois-Epis with its charming surroundings between vineyards and forests. 2. Soufflenheim - designed by Masters Champion Bernhard Langer and the well-known architect Kurt Rossknecht. This 18-hole course is located in the leas of the Rhine valley and shielded by dense woodland from the hustle and bustle of the outside world. This golf will please both experienced players and beginners, who will benefit from the great practice facilities. 3. La Wantzenau - The Golf de La Wantzenau is a nice course ready to welcome people who like unrestrained games. The course unwinds with a nice balance, holes through the woods alternate with some water hazards and wide pleasant fairways. 4. Rouffach. 5. Wittelsheim. 6. Mooslargue. À louer les yeux fermés. Maison confortable. Propriétaire super gentil et disponible. Nous avons adorés notre séjour. Maison familiale très confortable et sécurisé avec tout le nécessaire. Idéal pour famille avec enfant de tout âge. Les proprietaires sont charmants et disponibles. Nous y retournerons sans hésitation. La région est aussi magnifique. Et idéal pour des petites randonnées en forêt dans le coin. The gite is in a fantastic spot overlooking the mountains of the Alsace. It is well equipped and very comfortable. It is in a peaceful village with plenty of walks signposted from there. The town of Villé has all you need and has several good restaurants. The towns of Ribeauvillé etc are not too far away and Colmar & Strasbourg are an easy drive too. We spent a magical week during the Toussaint vacation here. Everything was perfect: comfortable, easy access to walking trails and spacious. It was everything we wanted and more! We travel quite a bit and this by far was one of the best gites we have stayed at in France. The fall foliage was beautiful and my children loved visiting the neighbor horses-they very sad to say goodbye to them. The house is well-equipped with anything you could possibly need for a vacation stay and again the immediate access to the hiking trails makes this a perfect getaway for nature lovers. One of the highlights of our stay was a sighting of some wild boar in the woods on one of our hikes. Close enough to Colmar and Strasbourg for day trips and the next town over has a supermarket for all the essentials. We would love to come back again in the future. Thank you so much for your feedback. I am really pleased to hear that you had a lovely stay at the Gite des Cerisiers. If your children like horses, I can recommend a great place locally, in Fouchy, where you can go on donkey and pony rides along the trails in the forest. Hope to see you again soon. We arrived late on the Saturday night. A very nice bottle of bubbly greeted us in the fridge. The Gite is amazing. Wonderful old beams and cosy living area. The decking has a wonderful view over the rolling landscape and you can catch the sunset with a nice glass of local wine. Lots of places to visit close by. I recommend a visit to the theme park just over the birder into Germany. Good swimming areas close by too. We had a brilliant holiday. Our family of five had a wonderful six night break here in the Alsace. The gite was really spacious and homely, perfect for us to relax and plenty to do for the children. The large terrace at the back had fabulous views over the village below and the whole valley. Alain, our neighbour, was very friendly and gave us some great local insight. There are plenty of places to visit in striking distance to cater for varied tastes. For the children I would definitely recommend the aqua park about five minutes drive away. Colmar is a must, as is Haut Koenigsbourg and the Silver Mines at St Marie Aux Mines. We spent a wonderful week at Les Cerisiers in April. The house is spacious, clean and well equipped, set in a beautiful, rural location overlooking the village. We enjoyed many afternoons and evenings sat on the decking, admiring the view and enjoying the tranquility (and the sunshine!). Alain, who looks after the house is a lovely person: happy to help at any time but never intrusive. There are some wonderful walks which can be taken from the house or throughout the region. The castles which are perched on hills and mountains throughout the area make great focal points for these walks. We all thought that Montaigne des Singes was one of the best days out for families (although we would enjoy it even if we didn't have the children with us!) and would definitely recommend it. Also, the stork / animal park near Hunawihr was good fun. We would recommend a trip into Hunawihr too, it is a particularly pretty village with an old, fortified church. We had good fun buying wine from Domaine Christian Barthel too and are glad to have brought away a reminder of our week. We were really sad to leave and would definitely like to return to Les Cerisiers to further explore this beautiful area of France where there is so much to see and do. Music Festivals (Decibulles and Les Eurockeennes), Corso Fleuri, Horse riding, Tour de France, Crystals exhibition in Sainte-Marie-aux-Mines, Wine Festivals, bird watching, fabulous Christmas Markets every day from the beginning of December through to Christmas in Kaysersberg, Colmar, Strasbourg, Obernai. La Petite Venise and Le Parc de l'Orangerie in Strasbourg. Great shopping area there too at Le Printemps and Les Halles. Obernai, Kaysersberg, Ribeauville and Riquewihr are all worth a visit - they are traditional alsatian towns. German cities : Freiburg (1 h) Stuttgart (2 h 30) has a fabulous zoo (one of our favourite places to visit) - it is a long day out though. Admission fees are quite reasonable too. If you are interested in history there are plenty of castles to visit. One of my favourites is the Mont Haut-Koenigsbourg. A local painting artist offers painting courses in the comfort of her own home. The area is also a perfect spot for walking - I have left a pack of circular walks at the property. You also have a selection of walks to go on from the house. The "Musee de l'Automobile" in Mulhouse is well worth a visit if you are interested in cars (old and racing cars). Also includes Formula 1 racing cars and other sports cars too. The Alsace region is also great if you want to visit the wine cellars along the wine road and discover the different types of wines produced. Visit Christmas markets and attend motor races. The nearest airport is Strasbourg (45 mins by car). Other airports are Mulhouse/Basel (1 hr) and Baden/Baden in Germany (1 h 30). Travel time from the Channel Tunnel is approximately 6 hours. The nearest supermarket is 1 mile away, in Ville. The nearest train station is in Selestat, 10 miles away. Colmar is 30 mins away and Strasbourg is 45 mins away. Kaysersberg, Ribeauville and Riquewihr are all picturesque towns located approx 20-30 mins away. In Ville (1 mile away) - you will find a corner shop, bakeries, clothes shop, shoe shop, restaurants, bike shop, sports shop, tourist office, banks (Credit Mutuel & CIAL), an indoor and outdoor swimming pool, a library, tennis courts. The supermarket "Super U" is located in the industrial estate. A Lidl and Norma supermarket are also in Ville. During the Summer months a Farmer's market is held every Thursday evening. In Selestat (10 miles away) - there is a wider range of shops available, and the best places for clothes shopping would be Colmar & Strasbourg. Changeover Day: Usual changeover day is Saturday. We will try and accommodate you if this needs to be different, please ask. You will be able to access the property at 4pm on your arrival day and it will need to be vacated by 10am on the departure day. Notes on prices: The property is available for week-ends during the low to mid season. Please enquire. Prices for this option start at £100 per night.